Ministry of Defence of India issued a notification for the recruitment of Navik posts under Domestic branch. 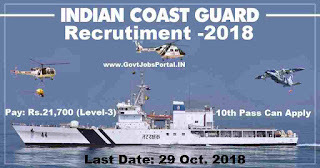 Indian Coast Guard department is looking to recruit fresher 10th pass Indian candidates for Navik job profile. This is a really very good opportunity for those who are looking for 10th pass Government jobs in India as a fresher. Indian Coast Guard department does not disclosed the vacancies in the official notification. 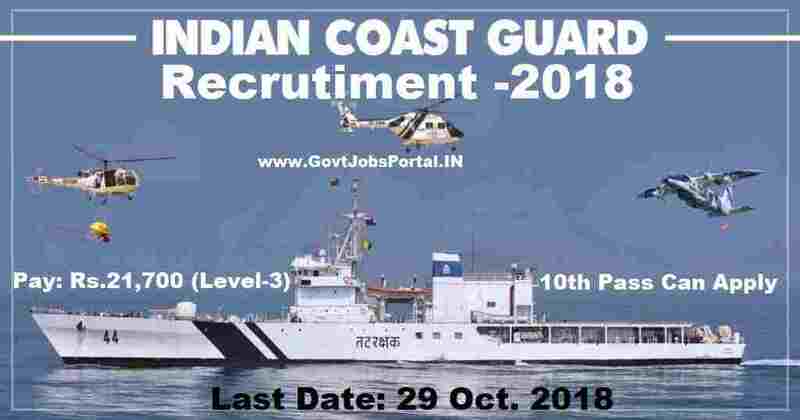 We share the whole information related to this Indian coast guard recruitment process below in this article. We took this information from the official PDF file shared by the department on the official website. So the rights of the information which we shared in this article goes to the official website of Indian Coast Guard department. Read the information below carefully before applying for these 10th pass Govt jobs in India. Pay Band: Rs.21,700 (Pay Level-3) + Other Benefits. Education: All fresher candidates from India who have passed in their 10th class examination with 50% marks from a well recognized education board of India can apply these Government jobs. Age Bond: Must have age in between 18 years to 22 years for applying these 10th pass Government jobs. Great news to all 10th pass candidates that they can apply for this Indian Coast Guard recruitment process without paying any application fee. ZERO application fee is required for applying. Indian Coast Guard recruitment department said that they are going to conduct Written examination as a first round for the selection. After that Physical and Fitness test will take place to final selection. So those who cleared the written examination will go through the Physical and fitness test. Applicants who have passed in the 10th class examination can apply for this Indian coast Guard recruitment process through ONLINE process only. The link for applying online for these 10th Pass Government jobs in India will be active on 15th Oct. 2018. The link will be remain activated up to 29th Oct. 2018. So the applicants have to apply online between these dates. We also share the Link for applying as well as for the official Advertisement under IMPORTANT LINK section. Check that section for more information. 15TH Oct. 2018 is the Starting Date to apply.